The Harbor Island Cardigan is relaxed, friendly, and warm - just the ticket for chilly nights in front of a fire or for a walk along the coastline. Its long sleeves, longer length, and deep V neckline layer beautifully. 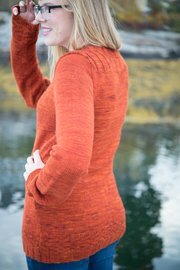 A textured stitch pattern is fun to knit and subtly showcases a beautiful yarn; thick 4x4 ribbing at the top of the sweater balances out the silhouette and provides a fun detail. 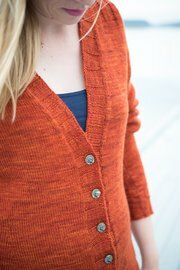 Lauren added extra length to her sleeves to allow for extra snuggle-ability and fold-over cuffs. To achieve extra long sleeves yourself, add length with the "customize fit specifics" screen. Harbor Island will look wonderful in any fit, but is shown in a 'relaxed' fit. 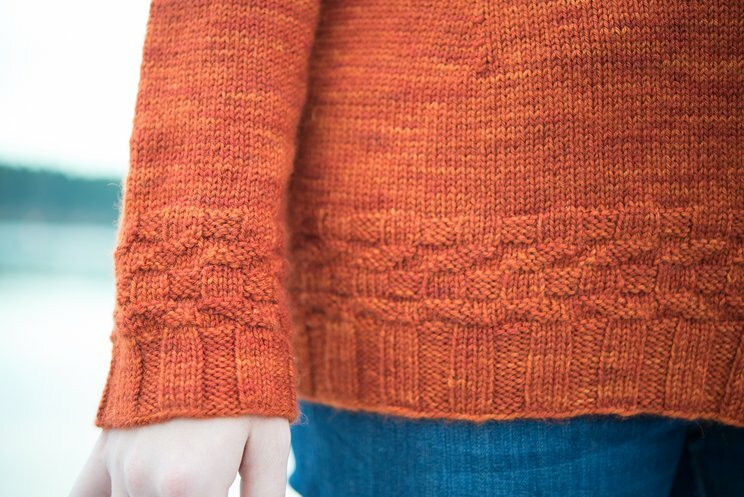 The sample is shown in Indigodragonfly's Sad Lester DK, an utterly gorgeous 100% BFL yarn that knits like a dream. It’s wooly, a little on the gruff side, and glorious to wear. We used the color “The New Black”, but Kim produces gorgeous, saturated shades - so find a color that speaks to you!